People tend to spend lots of money on buying pure and safe water and for that reason water filtration products have taken a real hold in the market. So, you would find loads of water purification alongside filtering products in the market and they will promise you to deliver the much-needed safe and pure water. However, with that promise in mind, when people don’t get the actual value for money from a specific water softeners, purifier or pitcher, then it’s normal they would be disgruntled and annoyed. Consequently, this extensive review of Brita 10-Cup Everyday Water Filter Pitcher will reveal the ins and outs of the product, ultimately helping you to choose the best water filtering products because Brita 10-Cup Everyday Water Filter Pitcher is the best in the business. So, let’s take a quick look at the review. What Is Brita 10-Cup Everyday Water Filter Pitcher? 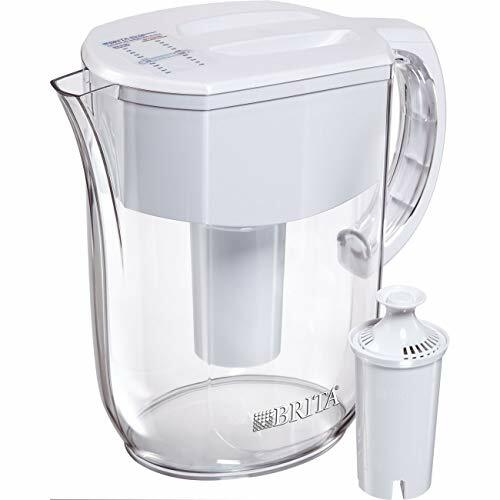 Brita 10-Cup Everyday Water Filter Pitcher is a water filter that is perfect for home or work environment and you can reduce the level of chemicals such as the zinc, chlorine, cadmium, copper, mercury to experience a great taste from the water. What’s more, with the help of this water filter, any kind of odor or unfavorable taste can be removed because it has carbon alongside ion-exchange resin filter that removes the unfavorable taste and odor. This filter from ‘Brita’ includes one filter along with a pitcher and you will be able to hold 10-cups of water simultaneously and it comes in a big size as well. To add to that, it is a cost-effective water filter as it is priced at only a mere $34. This fact makes it a superior alternative to the bottled water. There are indicators that will alert you about the replacing time of filter and these indicators have three colors. Additionally, the green light will indicate that the filter is good and the yellow one will alert you change the filter soon. Lastly, the red color will indicate the filter is out of order and needs to be replaced after two months. From the first sight, you will think that design is not an important issue of a product, but the usability of any products depends on the perfect design. In case of water filter products, the design plays a vital role because it will enable you to store the water filter easily. Moreover, Brita has introduced this product in ‘White’ color and as a result, you will face no crisis while blending this water filter into your home décor. In addition to its color, it is designed in a smooth manner and thus, it will consume little space from the fridge. So, it can be easily slotted into the fridge by you. Lastly, this unique water filter is well-designed and is very much convenient to the consumers due to the functional nature. Brita 10-Cup Everyday Water Filter Pitcher is very simple to use and the design aids to this fact as well. It has a removal lid and at the time of refilling the water filter, you will need to pop off the lid and glide the pitcher under the tap. Additionally, maintaining the best performance of the water filter is a crucial thing and you can do it with the sticker filter indicators. These indicators will track the performance of it and will let you know when to replace it. This product is certified and tested to decrease the level of copper along with mercury. Finally, it is very easy-to-use water filter and you can change the filter after using 40 gallons or 151 liters (Average time is two months). If I talk about the performance of this water pitcher, then I would only say good things because the level of performance is beyond my expectation. What’ more, when I used it to purify the water, I got absolute pure water with great taste. So, you are thinking what’s the main secret behind this awesome performance? Well! Brita 10-Cup Everyday Water Filter Pitcher uses carbon and ion-exchange technologies that can pure water by eliminating the chemicals. Moreover, you don’t need to put any extravagant effort to set it up. Just place the filter into specially designed holder of the pitcher and rest will be done by Brita 10-Cup Everyday Water Filter Pitcher. Lastly, even the kids will be interested to drink the filtered water of this water filter because the water is pure and delicious. Brita 10-Cup Everyday Water Filter Pitcher boasts some grand features that distinguish this product from the rest. These awesome features are as follows. It has a large capacity (10-Cup or 08 ounce). It grants ‘Healthier’ and ‘Great Taste’ water. One filter will replace 300 standard water bottles (16.9 ounces). It has ‘Sticker Filter Indicator’. It is a ‘BPA-Free’ Pitcher and the size is ‘Perfect’. It includes ‘One Filter’ and ‘One Pitcher’. It has ‘Great Design’ and ‘Study Handle’. Following are the advantages or the good things that I got from using Brita 10-Cup Water Filter Pitcher. From the security perspective, this water filter is immensely safe and sound because it is constructed with the BPA-Free plastic (Biphenyl A. or an Industrial Chemical to make Plastic). It is very comfortable to lift and hold because the pitcher has a big and soft-grip handle. The pitcher has 10 cups that are eight (08) oz sized and it can meet the water filtration demands of a big family. Additionally, one filter is added to the pitcher and it has a lifespan of 40 gallons/151 liters. The Filter is tested and certified (Water Quality Association’s Gold Seal Product Certification Program and NSF International) to reduce the copper alongside mercury and it will remove the bad taste of chlorine as well. It has a sticker filter with three colors that will alert you to change or replace the filter. The pitcher or this product is recyclable and you can do it by Preserve’s Gimme 5 Program. This water filter pitcher is not beyond the bad things and they are as follows. People who have used the previous models of this product don’t like this model and it does not include the flap at the spout to clean dust. There is no flip-lid, so, you have to change the lid on your own. Instead of electronic indicators, it has sticker indicators. Therefore, it can be changed to make the replacing work easier. Finally, I can say that Brita 10-Cup Every Day Water Filter Pitcher is an outstanding addition to the Brita family. People have given a green signal to this product for its usability and exceptional features. I have also found comfort and immaculate results while using this pitcher. So, if you are on a budget, then you should try it because this is an economical product that will provide pure water with a greater level of taste.